20 • WRAPS • 2 0 1 8 WRAP SHOP PRIMER BUSINESS & SALES The other piece of needed equipment is the plotter, or vinyl cutter, which is used for die cuts of printed and cutout letters and graphic images, Sumner says. Sumner says to expect to spend roughly $25,000 to $60,000 on a printer, $8,000 to $10,000 on a laminator and $7,000 to $15,000 on a plotter. For his business, Sumner started with a combined printer and plotter but soon saw a slowdown in production time, so he recom- mends separate pieces of equipment for the two steps of the process. He recommends against purchasing the least expensive equipment, which results in more frequent replacements, and making purchases with growth in mind to handle a larger scale of jobs but not going with the largest and most expensive options. "Don't buy the best of the best," Sumner says. "You have to make sure you have the work rst." Buying equipment with additional features can expand their ca- pabilities and save time but also will carry an added cost, Sumner says. Some examples include a take-up roll on the printer or lamina- tor to wind up the lm rolls and save on shop space, as well as color spectrometers to build custom color proles, but the proles from manufacturers will be enough to get started, he says. There also are basic tools that are needed to install the wraps, including a knife to cut the material, tape or magnets to hold it in place, a squeegee to apply it and release any air channels, and a heat gun for softening vinyl. THE SHOP SPACE To house the equipment and tools, a production room needs to be at least 800 square feet, Sumner says, adding that 1,000 square feet would be better to allow for a separate ofce space. The Carneys recommend that larger shops include a designated bay for vehicles and an area for training. They hope to purchase a new space by 2019 and add a gallery to display images of their n- ished products to offer a more welcoming and artistic atmosphere, Steve says. "We want an art gallery for what we do," Steve says. "Our shop is nice. It's welcoming, but we used what we moved into." 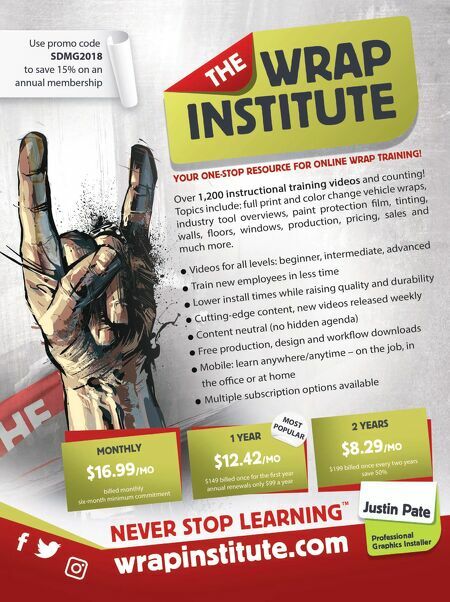 Wrap installers can start as small as an 80- by 40-foot space with a 15-foot door for production, sales and staff, according to industry veteran John Duever in an interview with Justin Pate, president of the Wrap Institute, in a video explaining how to set up a successful wrap shop, https://sdgmag.com/training/tips-setting- The back shop space at Visual Horizons is approx. 4,500 square feet and accommodates a full city bus. They can pull in multiple vehicles if needed. All vehicle install equipment (ladders, scaffolding, and lift) and install tools and chairs are kept neatly stored. Bright overhead lighting is also very important for installs. 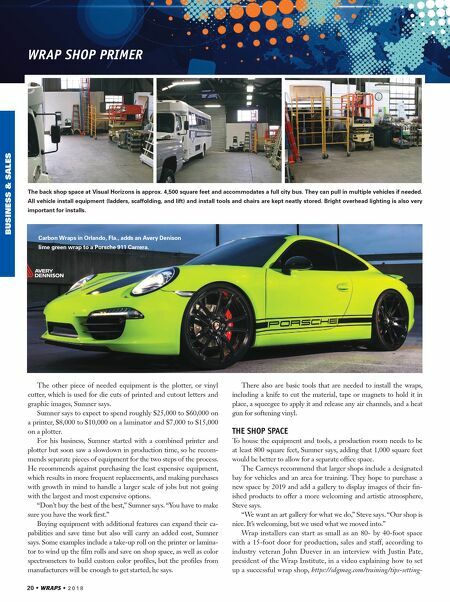 Carbon Wraps in Orlando, Fla., adds an Avery Denison lime green wrap to a Porsche 911 Carrera.